WW1 Reenactments Equipment : Great War Tommy WW1 Food Rations Labels : Canada First brand Canned strawberries. WW1 Reproductions and WW1 Reenactors Equipment / Kit - Canada First brand Canned strawberries. "Canada First" brand Canned strawberries. 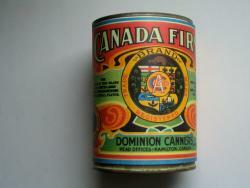 "Canada First" brand, 'Aylmer' choice quality canned strawberries label by Dominion Canners of Hamilton, Ontario. Label courtesy of Parks Canada.